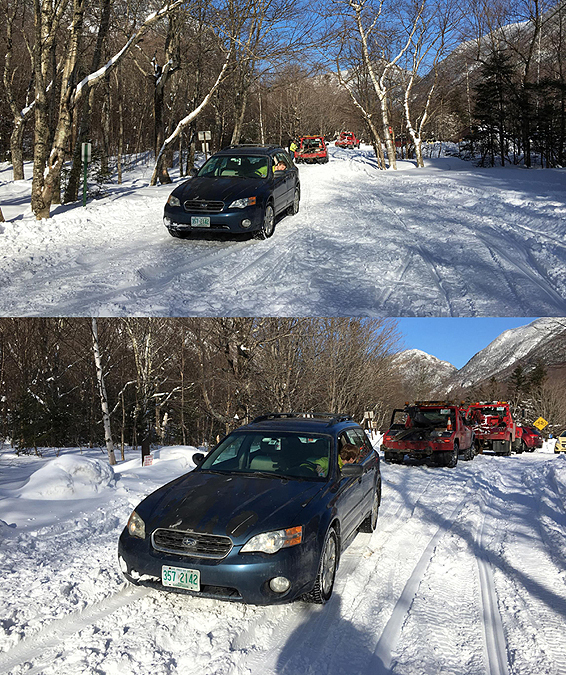 - A few snowmobilers tried to help Kyle out with a pull to no avail, although they got his car to at least be aligned in the right direction, but he was off the hard packed snowmobile track, and was now stuck even worse. - Next, about a dozen hikers tried helping him out of the jam for the next half hour, we were able to get the car going but it was veering for a boulder so that lead nowhere too. It was really nice to see hikers come by and want to help out, in fact other than one crotchety old hiker who tried to ridicule Kyle asking if he could read, everyone understood it could happen to anyone. - After a couple of hours the tow truck arrived and hooked up the cable to Kyle’s car, but again his car was veering towards that boulder, even worse the tow truck was now stuck too, albeit only a few feet from the pavement. - Finally, a second tow truck came along and they figured out a way to pull Kyle’s car without dragging his car into the boulder. Instead of having a direct line to his car they swung it around a tree about fifty feet off to the right so it would pull his car away from the rock and up onto the snowmobile track, where they then unhooked from around the tree and hooked back on a direct line to safely pull his car out. Oh yeah, this all happened while tow truck #2 was hooked into tow truck #1 who was hooked to Kyle’s car! - And that my friend is how Kyle and I spent New Year’s Eve morning, which was also Kyle’s 27th birthday. Happy Birthday, Kyle, one I’m sure you’ll never forget!! - Anyway, a week later we were back to the scene of the crime, parked safely across the street. We started our hike at 9AM, it was about five degrees out but with no wind we were able to heat up quickly and enjoy a beautiful hike up old Bridle Path and Greenleaf Trail. Except for some minor wind drifts along the Franconia Ridge the trails were all packed down solid and built for speed. - The forecast called for sunny skies but that wasn’t the case as an overcast loomed above us all day. There were blue skies to the northwest, and some thin clouds hoovering around Little Haystack with the sun brightly shinning behind it but not through it. - It was amazing how calm the weather was above treeline, there are not too many days where you can shuffle along the Franconia Ridge in January when there is zero wind and enjoy the views even as the weather struggles to reach ten degrees. - On Sunday I had to head to RI in the afternoon but I wanted to get in some strength training and a quick hike before heading south. I got up early and hit up the local fitness center before heading to Crawford Notch for another cold but easy hike. - Mount Jackson is a five mile round trip, which in the winter when broken out is actually an easier hike than in snow free months because the footing on the trail is one of the top five most eroded trails in the White Mountains, it’s gnarly squared. - On this morning it was a super packed highway, and for the second straight day the snowshoes got a free ride on my pack. Unlike yesterday, it was a little breezier up top and temperatures were struggling to reach zero too. Luckily, I was able to stay warm on the hike up as the trees shielded me from the wind, which even though it wasn’t windy at all, maybe 15 MPH, it doesn’t take much to chill a hiker to his/her bones when the air temp is zero. - Views from the top were incredible as it was a bluebird day, so I snapped a few pics and scurried back down below the trees as unfortunately for me the five minutes I spent up there was during an extended gusty period, and like I said it doesn’t take much wind to freeze your eyelashes and eyebrows! #1 is where Kyle original was stuck, #2 is where a snowmobile dragged him to, Tow Truck #1 got stuck just inside the "no highway vehicle" zone, tow truck #2 hooked onto him, while truck #1 hooked around a tree to move Kyle away from the boulder and back on the snowmobile track, where they could hook up to him using a straight on approach...as you can clearly see from this very detailed drawing! Hiking up into the sun! Mount Lafayette's summit cone in the middle of the winter is when it is looking the most majestic! Great images, both hikes! It is interesting how persistently different this winter is from last in the Whites. Thanks, Doug! It has definitely been a better winter so far, lot more snow and beautiful in the woods and above the trees, hopefully it'll stay this way for the next few months!